Info "Looks like this barista put a lot effort into capturing my face perfectly. Too bad! I'm totally gonna ruin it when I stir up this latte." 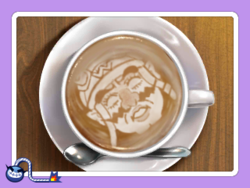 Thanks a Latte is one of Wario's Touch League microgames in WarioWare Gold. The player must use the stylus to stir up the latte. 1st level difficulty: The latte must be stirred a little to win. 2nd level difficulty: The latte must be stirred a little more to win. 3rd level difficulty: The latte must be stirred a lot to win. This page was last edited on March 9, 2019, at 14:43.